For a long time, I’ve had this personal belief that this is the most over-covered song in the history of songs. Every time I hear a cover of “Hallelujah,” my initial reaction is why? Why, why, why? The last four days of my life can best be summed up in one word: Juxtaposition. Over the last four days, my heart was broken down only to be built back up again. Over the last four days, I saw things I never knew existed and never thought to be possible. Over the last four days, I found hope in the craziest of places. To say it’s the most impoverished country in the western hemisphere doesn’t even begin to cover it. There are few paved roads. There is little infrastructure. In the faces of many, there is no hope. On Saturday afternoon, we parked the truck in a big, dirt lot surrounded by concrete buildings. This picture describes the way much of Haiti looks. As we hopped out of the truck, everyone I was with became solemn, so I followed suit. Truth be told, though, I had no idea where we were headed or what we were about to encounter. As we turned the corner to enter the large concrete building, no sounds echoed out of it. Our first greeting, rather, was a smell. It was a smell I’d later come to describe as hopelessness. Urine mixed with feces mixed with body odor all churned together in the hot, Haitian heat. We walked up stairs and turned another corner into a dark room lined with a dirt floor. There were no pictures, no toys, nor any light in the room. Just 40 little faces staring back at us as they sat tightly together on six, thin wooden benches. They were the faces of children. Children abandoned. Children forgotten. Children lost. And although their lips were tightly pursed silent, their eyes void of any joy screamed loudly. “Help me!” “Love me!” “Please,” they said. Before I could grasp the gravity of the situation we encountered on what started as a relatively uneventful Saturday afternoon, one of the older children was walking towards me with an infant in his hands. The infant was wearing a white shirt, torn to pieces and dangling off of his slim body. Without so much as a smile on his face, the older child thrust the infant in my arms. As I positioned the infant, he immediately grasped his arms around my neck in a bear hug-like position. We’d remain this way for hours. I looked him in the eyes. I brushed his face. I coo’d in his ear. He didn’t flinch. No smile. No movement. No giggles. No noise. Just a body. No life. I kissed his smelly body. I whispered, “You’re perfect, sweet boy” in his little ears. I told him that Jesus loves him. Just a body. A boy forgotten. There are over 500,000 orphans in Haiti. In July, they became my cause. The rallying cry of my life. Through a series of twists and turns and avenues, I’ve become connected with I’m Me, a foundation co-founded by NFL player, David Nelson, and his brothers. Through I’m Me, I sponsor a 7-year-old boy, Prosper. 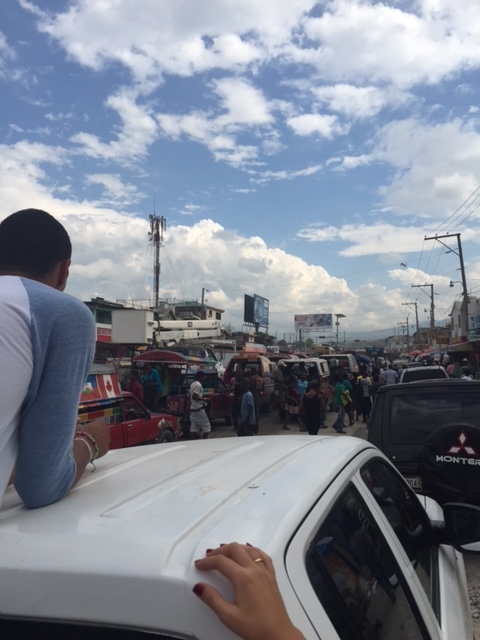 I went to Haiti this weekend to meet Prosper and see what I’m Me is doing on the ground there. 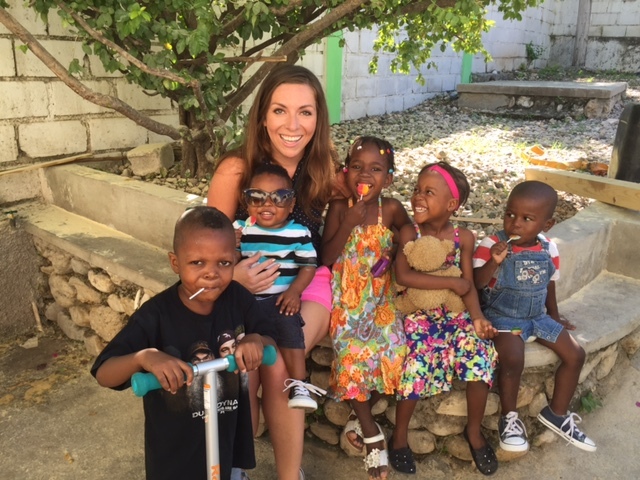 Most of all, though, I went to Haiti to see how I can serve the 500,00 orphans in Haiti. I went to Haiti to in my small way, show them that they haven’t been forgotten. As my trip approached, I began researching Haiti. Its economy. Its government. Its natural resources. At the end of the day, though, the only thing I wanted to know was why are there so many orphans? Through internet research, I couldn’t find a clear answer. 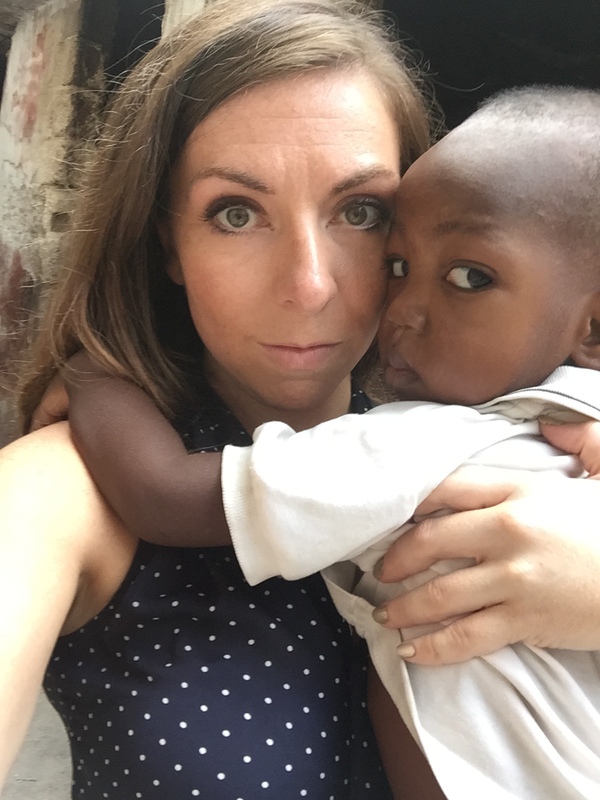 It took going to Haiti to understand why so many children are orphans. The majority of the orphans in Haiti are not children whose parents have passed. Rather, most orphans in Haiti are “poverty orphans.” These are children whose parents give them up to orphanages because they cannot afford to take care of them. The average daily income of a Haitian family is $2. With a lack of access to birth control and no formal educational system, the birth rate in Haiti is high. 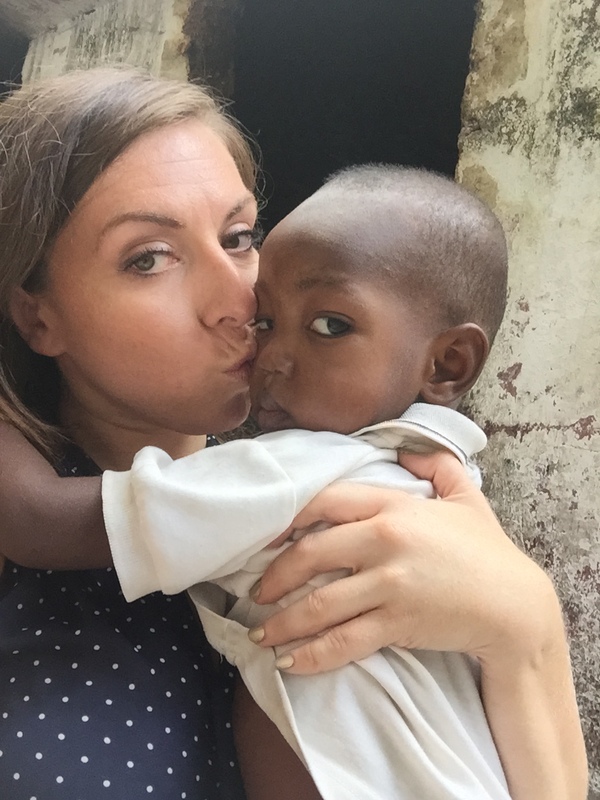 With many mouths to feed and few financial resources to do so with, many Haitians surrender their children to orphanages. The thought behind this decision, is that the orphanages are better equipped to provide for their children. The concrete building we walked into on Saturday afternoon was one of those orphanages. And if this “institution” is better equipped to take care of anything than anyone else is, I’ll be damned. There was no electricity. There was no running water. There were no beds. All there was, were 40 tiny faces, some “caretakers” and those six wooden benches. The children’s bathroom was a small room covered by a door with a hole to urinate and defecate in. The problem, though, was the hole was filled up. So, children urinated and defecated wherever they could, the most common place being on the floor which also served as the place where they rest their heads at night. There were no toys. There were no pictures. There was no sound. There were no beds. There were no mattresses. There were not even mats. We learned that to sleep at night, the children oftentimes piled upon each other, to gain some semblance of comfort. There was no life inside of those concrete walls. I went to Hell on Saturday. And the worst part about it, was 40 innocent, helpless children were living there. Soon after we arrived at the “orphanage,” David stood in front of the room and with an interpreter, asked the children if they had dreams for their life. He asked them what they wanted to be when they grow up. A few raised their hands. Those who did, were asked to come in front of the group and share their talents. Some danced. Some sang. Him, though, I’ll never forget him. He walked to the front of the room quietly. And he stood in front of it for a few seconds before he did anything. Everyone remained still, looking at him silently, lifelessly. When we walked into the concrete building and I saw the conditions, I told myself to hold it together. To be strong. To not show the horror I felt on my face. For anyone who knows me, I SHOW EVERYTHING ON MY FACE. There are no secrets in Alicia Jessop land. For the first time in 30 years, my face almost didn’t show the cards of my heart. After all, this concrete building void of anything was these children’s home. And I didn’t want my face to reveal to them how dire their situation was. When his voice rang out, “Hallelujah,” though, I lost it. I walked across the room, turned my body the opposite direction and wept. I held that sweet baby and just prayed for him. I prayed that God would rescue him and send angels to lift all of the other babies in that “orphanage” out of their Hell. The little body I was holding hadn’t eaten in four days. He was lifeless for reasons other than his surroundings. He was lifeless, because truth be told, he was facing death. David rounded us up shortly thereafter. I kissed babies goodbye and whispered words of hope in their ears as I brushed their heads and squeezed their hands. We hopped back in the truck and as I sat on the tailgate as it wound through Port-au-Prince’s crowded dirt roads, I wondered WHAT THE HECK I JUST ENCOUNTERED and HOW CONDITIONS LIKE THIS STILL EXIST ON THIS PLANET. About 30 minutes into our drive, our driver stopped the truck. He got out of the car and walked somewhere. I figured he just needed a break from the traffic and from our incessant listening to Taylor Swift’s “1989” album. He came back a few minutes later and said to David, “They have some.” David hopped out of the truck and at this point I was royally confused but figured it best not to ask questions. 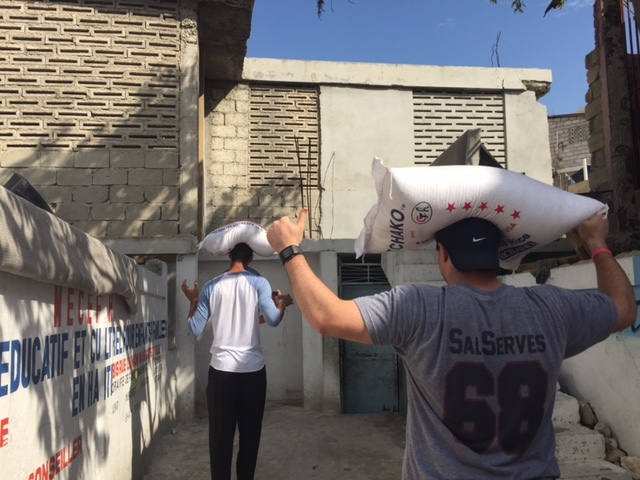 David returned a few minutes later with two of the biggest bags of rice I have ever seen and before I knew it, we were reversing our course and heading back to the “orphanage.” For the first time in days, the babies wouldn’t have to worry about being fed. As we entered, there were a few more smiles on the faces of the children. The woman who ran the “orphanage” was gracious. For the moment, there was hope. Through despair, dirt, pain, suffering, hopelessness and in Hell, I saw God this weekend. I saw God this weekend, because THANK GOD, I experienced Friday before Saturday came. 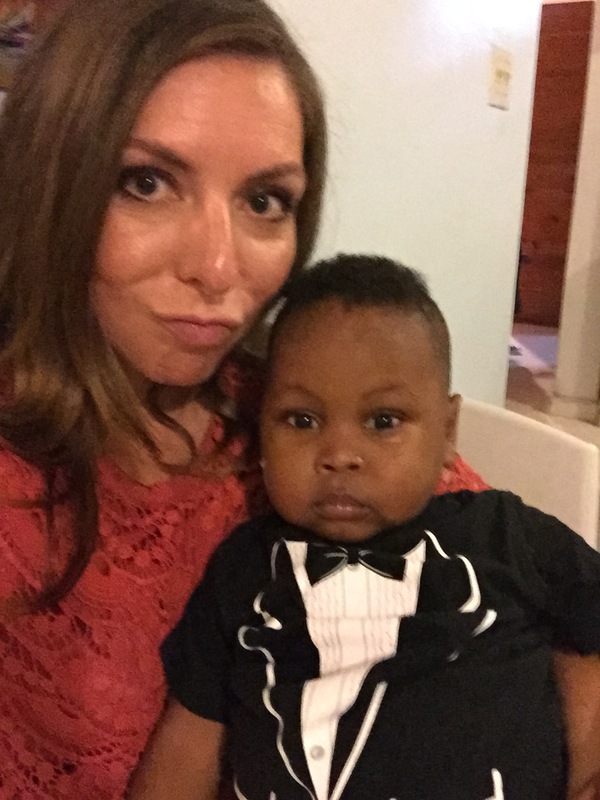 I landed in Haiti on Friday, November 7–David’s 28th birthday. Shortly after I landed, we went to the children’s home he and his brothers started. The children’s home houses nine children who were taken from the “orphanage” we visited. David tells me that when he took Taina, Germima, Rodelencia, Georgina, Witza, Robensley, DaeDae, Wilson and Prosper from the building, that they were in worse condition than the children that we met there on Saturday. Knowing the gravity of those children’s condition made this thought sting in my heart. How could a child be worse than lifeless? As I stood there behind him, I thought to myself how fitting it was that on the day we celebrate the beginning of David’s life, we celebrate the life that he and I’m Me have given to others who needed life the most. Beyond that though, in my heart I said to God, “Thank you God, for love.” Because only through love, is hope created. David’s 28th birthday party was the most fun birthday party I’ve ever been to, and for brevity’s sake, I’ve been to some really good birthday parties. It was the most fun birthday party I’ve been to, because there was so much joy. I’ve never laughed so hard. I’ve never danced so freely amongst perfect strangers. I’ve never felt so comfortable to lend my voice to song. That night, at that house, was heaven. And it awoke my eyes to the possibility that hope is not dead in this world. It awoke my eyes to the belief that a few people can change the world. It awoke my eyes to the knowledge that now, since I have seen Haiti’s pain, I cannot turn on it. My life’s purpose has been revealed. And it is to give all of those babies a life free of worrying where their next meal will come from. It is to give all of those babies a life free of wondering where they’ll lay their head at night. It is to give all of those babies a chance to live out their life’s purpose and experience their full potential. The past four days were a roller coaster for me. I cried myself to sleep every night, hoping no one else would hear me. There were happy tears, over the promise of the nine children I’m Me dug out of Hell. There were sad tears for the children still living there. There were tears of thankfulness that God brought me here. There were tears of fear wondering if I’d ever be able to do enough to help. Most of all, though, there was hope. Hope found in the promise that our God never leaves us. Even when the world looks like the pit of Hell, He is there. Hope found in experiencing firsthand the goodness of others. Hope found in the understanding that we are all here to help our fellow man, no matter how old, young or far away he may be. Hope most of all, though, hope was found in the learning of just how quickly love can restore life in another. The children in the I’m Me home are thriving. They are fed three meals a day and eat snacks. For the first time in their lives, they are attending school. They are being taught about Jesus and how to place their worth in Him. They are the most fashionable kids I’ve ever laid eyes on. They have their own unique, special personalities. Personalities that are comedic, shy, mischievous and flirtatious. They are becoming themselves, exactly in the way that God made them and intended them to be. Through love that has been showered upon them over just four short months, their lives have received hope. They are living. They are thriving. And my happening upon their lives is the greatest blessing I have ever experienced in my 30 years of life. And for that, the only thing I can say, is Hallelujah.